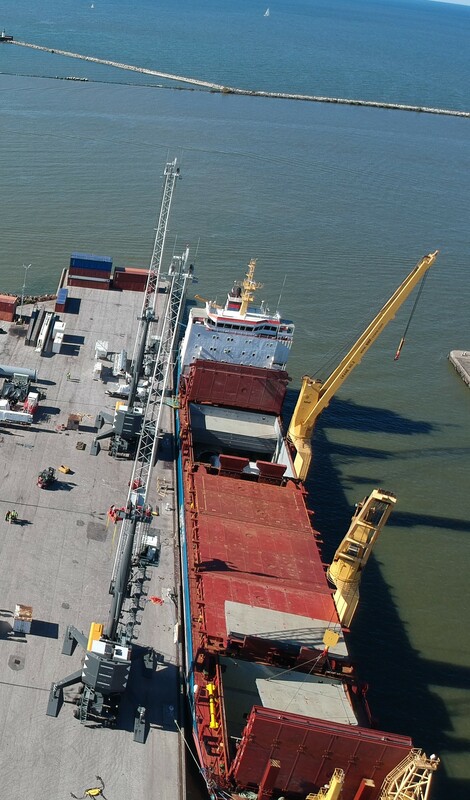 Last week, the Port of Cleveland welcomed a ship from Rotterdam, Germany containing a disassembled tunnel boring machine, known as a TBM, that will mine our Doan Valley Tunnel starting early next year, the latest Project Clean Lake tunnel in the works. “I’m both excited and anxious,” said Construction Supervisor Karrie Buxton as she anticipated the ship’s arrival at port. It’s a huge shipment for a huge project. 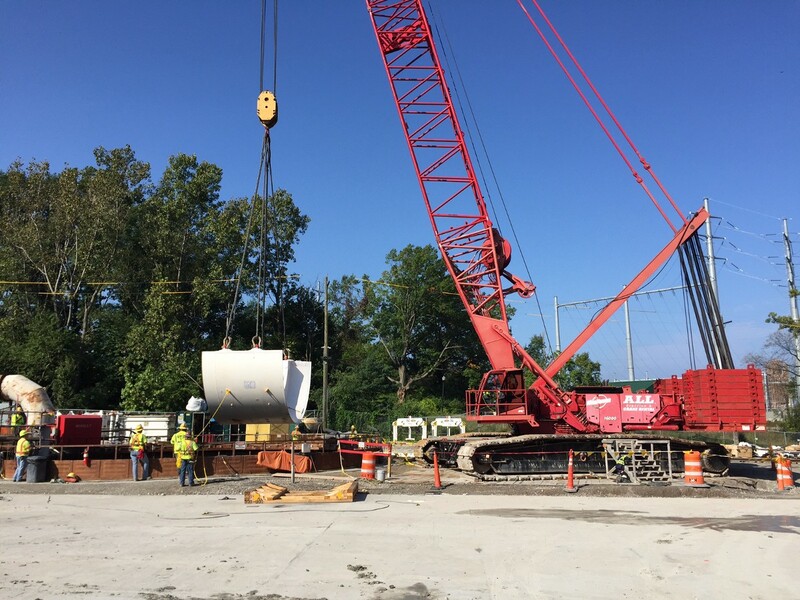 The Doan Valley Tunnel will reduce Lake Erie pollution by 365 million gallons a year upon completion in 2021, measuring more than 10,000 feet long and 18 feet in diameter. The TBM is smaller than Mackenzie, the TBM who mined our Euclid Creek and Dugway Storage Tunnels, but she’s still enormous, and special in her own way. 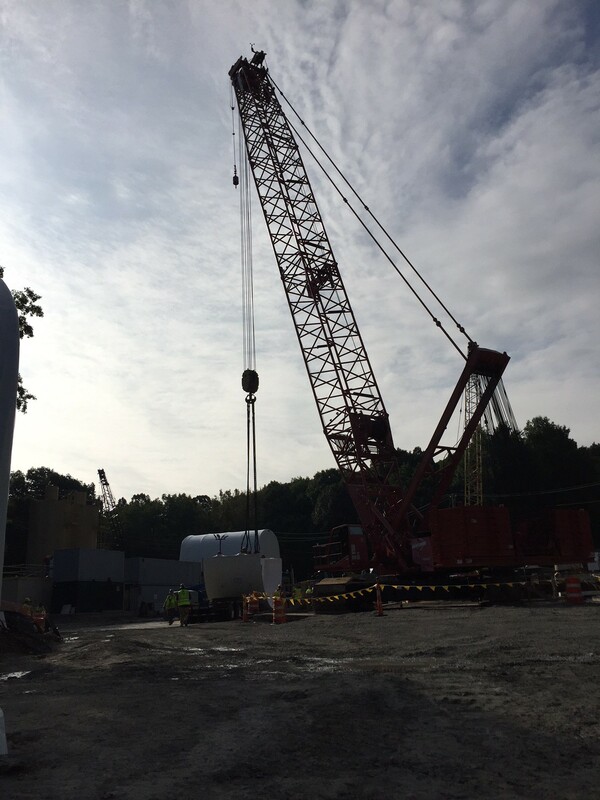 A crane lowers the recently delivered TBM tail shield into the access shaft where Erin Melissa will be reassembled deep underground. Named Erin Melissa by the contractor, this TBM measures 21 feet tall, 480 feet long and will weigh 950 tons when fully assembled. By comparison, Mackenzie mined tunnels 27 feet in diameter and she weighed more than 1,500 tons. Unloading the ship took a day’s work, but over a week’s time, the TBM’s components will be trucked from the port to Ambler Park near Stokes Boulevard and MLK Drive where the first shaft of the Doan Valley Tunnel awaits her. That job will take 55 tractor trailers. Upon arrival, Erin Melissa is slowly lowered piece by piece into the shaft and re-assembled underground to begin mining, a journey that will end near East 115th and Superior Avenue.